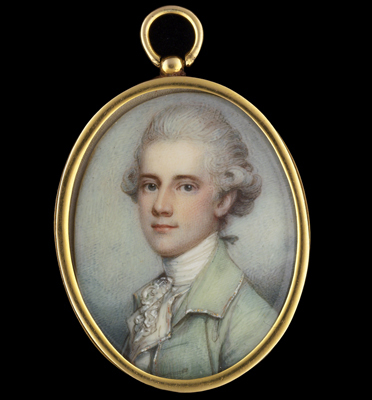 The legacy of Richard Cosway in the history of portrait miniature painting in England can hardly be overstated, his contribution both stylistically and publicly to the genre influenced entire schools of portrait miniature painters in the years to follow. Richard Cosway was Born in Devon and sent to London at the age of just twelve where he entered William Shipley’s drawing school. Soon after his arrival, Cosway won numerous prizes for works exhibited and in 1769 entered the Royal Academy Schools, where he was to later become an associate (1770) and then a full academician (1771). In 1786 Cosway was made ‘Miniature Painter to the Prince of Wales’, and they became close friends until the Prince became Regent in 1811 and Cosway lost his position. The present work was painted relatively early in Cosway’s career, c.1765, and survives in remarkably good condition with no loss of vitality. The flesh tones for example seen around the sitter’s left eye retain their humanist qualities and the pale green jacket, although highly vulnerable to sunlight, has maintained its subtle luminosity. Cosway’s experience despite his young age can be seen in his manipulation of the ivory surface, most evidentially in the white stock where the ivory is left exposed - the artist only daubing it with white and light grey details to complete the effect.